The next review on El Norteño will be on a 1 ounce/28 gram meat stick on their habanero flavor. Tira de carne in Spanish translates to meat stick. 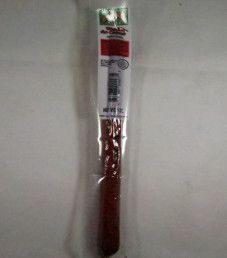 A combination of beef and pork is used in this meat stick. 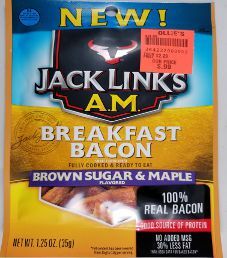 This jerky was graciously submitted for review by Justin Jahnke. 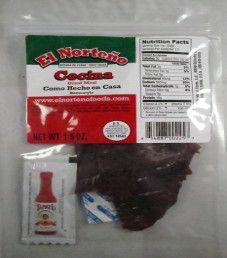 The first review on El Norteño will be on a 1.5 ounce/43 gram bag of their homestyle flavored beef cecina. The word cecina is Spanish for “dried meat”, the same basic definition of jerky. The flavor name homestyle is translated into Spanish on the bag as “Como Hecho en Casa”, which translates in English to “Like the Taste of Home”. 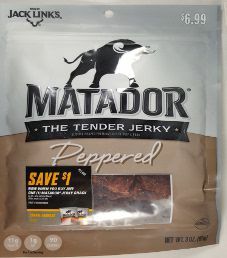 This jerky was kindly submitted for review by Justin Jahnke. 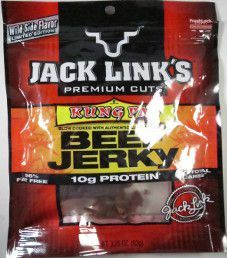 The next review on Jack Link’s will be on a 3.25 ounce/92 gram bag of their Kung Pao flavored beef jerky. This bag was purchased at a store named Greggs Market Place, in Marathon, New York.